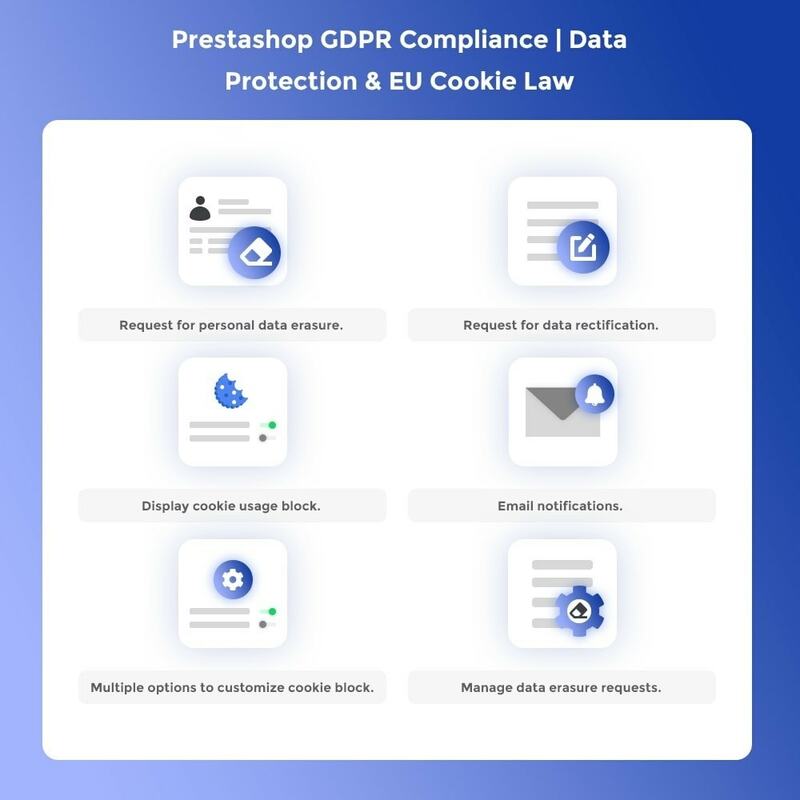 GDPR Compliance module : comply with new regulations, GDPR & European Union cookie and ensure your customers of data protection. Allow your customers to update or delete their personal data present on the website whenever they want. Assure your customers of data security with GDPR. Allow your customers to download their personal data. Display GDPR agreement checkbox on core Prestashop form and module's form. Allow your customers to update their personal, address or any other information. This module allows admin to make his website GDPR compliant. This module allows admin to comply with EU cookie law. Admin can enable/disable the auto approval of personal data deletion of the customers. Admin can configure GDPR email notification settings. Admin can configure the position, image, and text of a cookie block to be displayed at the Front End. Admin can enable/disable the display of GDPR agreement checkbox on Customer Registration form. Admin can enable/disable the display of GDPR agreement checkbox on Customer Personal Information Form. Admin can enable/disable the display of GDPR agreement checkbox on Customer Contact Form. Admin can enable/disable the display of GDPR agreement checkbox on module's form. The customers can download their personal data on the website in PDF format. The customers can also email their personal data to their desired email ids. The customers can update their personal/address information. The Customers can access, update, and delete their personal data on the website. Admin can manage all the requests placed by the customer for data erasure. Admin can download or delete the personal data of a customer. The customers will receive an email notification regarding the confirmation of data deletion. The customers will receive an email notification with the attached PDF file containing the updated personal information. Vous avez besoin d'appliquer une Augmentation, une Baisse ou un Prix fixe à vos produits? Avec ce module vous pourrez le faire par Catégorie, par Produit, par Groupe de Clients, par Pays, par Zone, par Fournisseur et par Fabricant. With GDPR, customers get assured of data security and they can browse and shop with confidence in the store. Customers can retrieve their personal data on the store in a PDF format. Customers can also email their personal data on the desired email ids. Customers can request for rectification and erasure of their personal data. 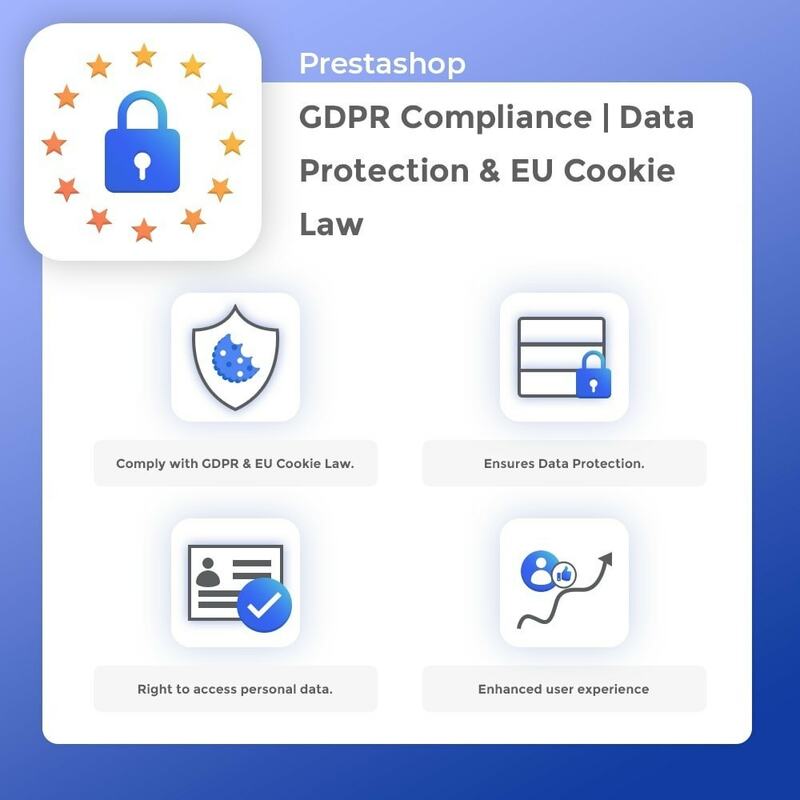 Search “Prestashop GDPR Compliance” in the search box then go to the module and click on install.